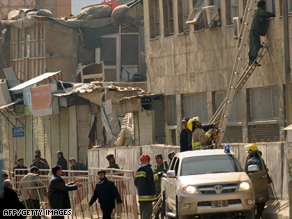 KABUL, Afghanistan (CNN) -- Eight Taliban suicide attackers struck Afghan government buildings and a prison Wednesday killing 19 people in a coordinated attack that the Taliban said was in retaliation for the mistreatment of prisoners, according to Afghan officials. Security forces and emergency services attempt to enter the Justice Ministry in Kabul. The deadliest strike happened at the Ministry of Justice where five of the attackers stormed the building here, prompting a three-hour firefight with Afghan soldiers and police, defense ministry spokesman Gen. Mohammed Zahir Azimi said. "This attack shows the real face of the Taliban," said Gen. David D. McKiernan, with the NATO-led International Security Assistance Force. "This is another example of the Taliban impeding progress for Afghans." It was the same type of attack carried out by the Taliban in October, also against Afghan government buildings in Kabul in broad daylight. The exact breakdown of the 19 deaths and 45 injuries from Wednesday's strike was not clear, but Azimi said most of the casualties were at the justice ministry, including civilians and guards. Afghan forces shot a suicide attacker at the Ministry of Education, but he managed to detonate his explosives outside the building, Azimi said. There were no other casualties. Two suicide attackers detonated their explosives at a prison near the Khair Khana district, north of Kabul, causing several deaths and injuries, according to Azimi. The Taliban claimed responsibility, saying they were retaliating against the mistreatment of prisoners in Afghan jails, Zemarai Bashary of the interior ministry said. In the attack at the justice ministry, two gunmen burst in and killed three government employees before police overpowered them, Bashary said. Police swarmed in, looking for more assailants. Witnesses who had gathered outside heard intermittent bursts of gunfire from deep within the building. Shortly before 1 p.m. Wednesday, police dispatchers said officers found a third gunman holed up in one of the rooms. He was killed in the gun battle that ensued. In late October, Taliban suicide bombers stormed the Afghan Ministry of Information and Culture and opened fire on guards outside the building in a coordinated attack that left at least five dead. Taliban spokesman Zabiullah Mujahid said the attackers killed six guards in the attack, which targeted "foreign advisers" at the ministry. A French soldier and his interpreter were killed in an attack in Afghanistan Wednesday, according to the office of French President Nicolas Sarkozy. A second French soldier was seriously wounded. "This morning the President of the Republic was greatly saddened to learn of a murderous attack... against French soldiers who patrolled with a part of the Afghan national army in Logar province, south of Kabul," the Web site statement said. -- Journalists Tamim Mayar and Tom Coghlan contributed to this report.